The popular impression of Timothy Treadwell, who died in Alaska just over two years ago, is that he was a delusional crackpot who deserved his fate: to be killed and eaten by a bear. News coverage painted him as a foolish amateur bear biologist — well-intentioned but not very bright — who paid with his life because he ignored the advice of those who were wiser. 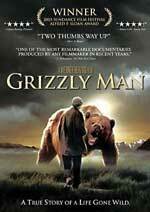 But like the man whose life and work it analyzes, Grizzly Man, the new Werner Herzog documentary, is complex. As it fills in the contradictory and frequently infuriating details of Treadwell’s outsized personality, it invites reflection on the similarly complicated relationship between Americans and our shrinking wilderness. Herzog’s documentary, drawn largely from the gripping video footage Treadwell shot during his 13 summers on the Alaskan peninsula, reveals Treadwell as narcissistic and misguided. Treadwell exaggerates his role as the bears’ guardian against development, poaching and other threats. Poaching, though, has never been much of an issue in Alaska, where grizzlies may be hunted legally, and the area in which he spent most of his time is already protected from development because it’s in a national park. But the film makes it clear that Treadwell was sincere in his uncritical love of the wilderness and its inhabitants, and that the backcountry served him as a healing refuge from modern American life. Treadwell is hardly the first person to find the urban environment spiritually toxic, and to flee for refuge into the wild. American history is littered with poets, writers and just plain folks who have done the same.